Reunion Malbec, 2009 Mendoza | the wine snob. Who loves Malbec? You ALL do. I know you do, because it’s our best seller at Cellar! A Cellar-best-seller I call it. Not my most creative use of words, but it sure it fun to say. Cellarbestseller. Argentinian wines, especially Malbec, have definitely boomed over the past several years. Malbec Mania, you could call it. The United States imported a whopping 48% of Argentina’s exported Malbec in 2010! (source). We luuuuvs the stuff. And while I’ve heard buzz from various wine publications that Chile may be poised to rival Argentina in 2011 in terms of sales, if Columbia is any indicator, Malbec hasn’t lost any ground. In all honesty, Columbia probably isn’t a good indicator, but that doesn’t serve my point very well. But onward we move- let’s talk about why this wine rocks! First of all, I know you want to know how much it costs. Because you’re not going to keep reading if its outta your price range. But it’s only $13! So keep reading! Malbec consistently over-achieves in this price range, which is a good reason it’s so darn popular. Malbec is perhaps one of the friendlier grapes I know; it is approachable, easy-going and likeable, and the Reunion is no exception. A concentrated deep magenta/purple-y color, it is ripe with flavors of plum and cherries, with a truly lip-smacking palate of dark chocolate, black pepper, and light leather. Its right on the money at 13.5% alcohol, as you are not left with any hotness whatsoever. It strikes me as a relatively unmanipulated wine, meaning it is a pure expression of what an Argentine Malbec should be, without excessive interference from oak or a meddling winemaker. It just is. malbec grapes. they look a lot like... grapes. I’m trying desperately to come up with a superhero to compare this wine to, but I think that would be a bit of a reach, even for me. Basically I saw X Men First Class this week and it was amazing, so all I can think about are superheroes. Allow me to divert into a bit of a rant, if you would. Up until last week I didn’t think there were people out there that legitimately think it’s okay to make fun of someone for liking the X Men movies. I was called a loser, I was asked if I was going to get an X Men lunch box, and a slew of other insults were hurled at me by this person (ahem… Trevor). Personally, I question anyone that cannot appreciate a good escape into fantasy. I question their inability to enjoy things that are imaginative and fun and allow us a brief respite from our everyday lives. How is this a bad thing? It’s FUN to imagine a world where I don’t have to pay bills, return library books on time, vacuum up the never-ending amount of cat hair that coats my floors, or remember to change the air filter in my AC. It would be much cooler if I could control metal, read people’s minds, fly, create hurricanes, or make myself look like anyone I want. So go see X Men First Class. It’s good. And when you get home you can open a bottle of wine and contemplate what super powers you would want if superheroes were real. This is a better use of time then watching a lot of the crap that’s on TV, in my opinion. 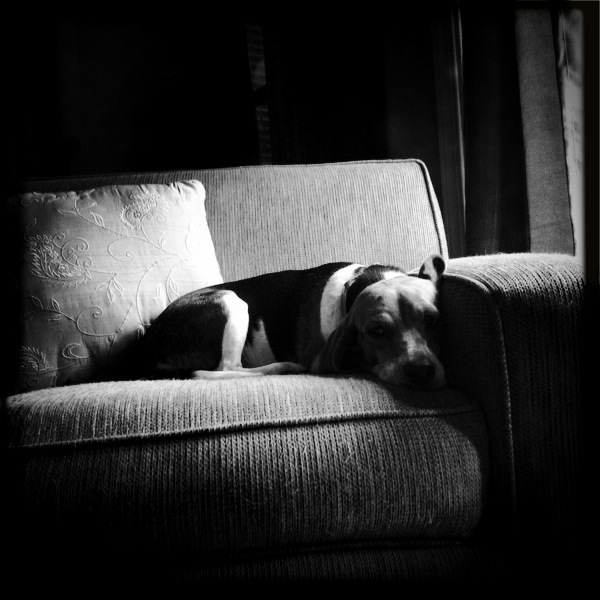 She’s just chillin’ in the armchair. She’s a very Zen sort of beagle. I think she appreciates fantasy life. And maybe even wine. Alright that’s all I got for today. 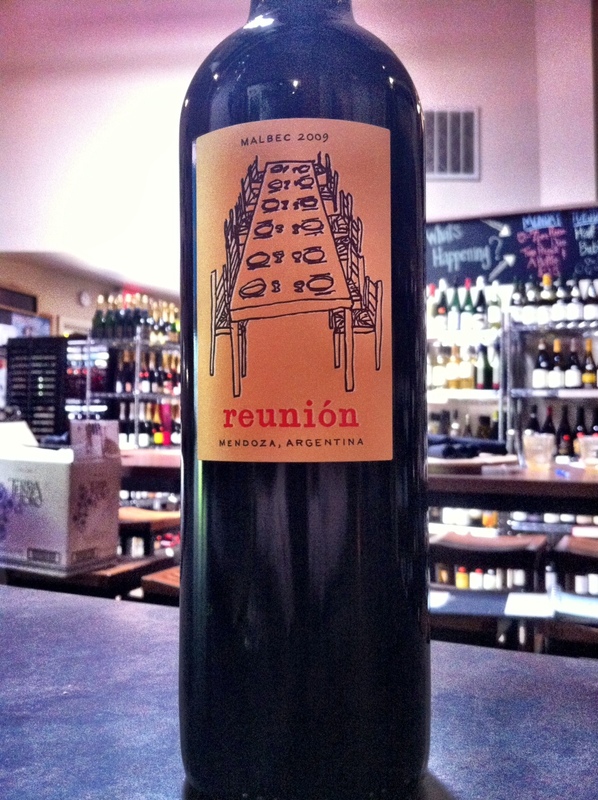 Reunion Malbec is by the glass at Cellar on Greene for the forseeable future, and can of course be purchased to take home for $13 a bottle any old time you want!